Looking around any college campus, there is no doubt that technology has fundamentally changed the way we learn. From researching through online catalogs to turning in papers online, computers are helping us learn faster, interact more efficiently and conserve resources. While the primary device of a college student is often thought of as a laptop, the cell phone can also be used to improve the college experience. 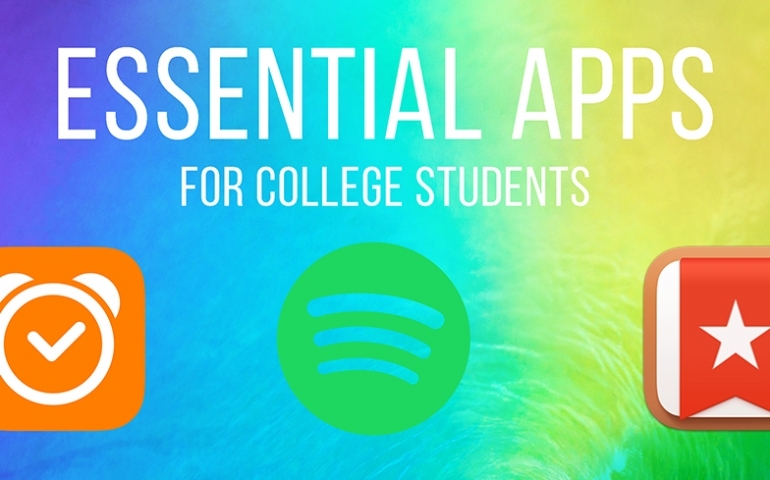 Here are some of the essential apps that every college student needs. Sleep Cycle is an alarm clock app that has vastly improved the time I spend sleeping. Unlike other alarm clock apps, Sleep Cycle tracks your sleep patterns and wakes you up during light sleep. Using this app will make you more awake and energized when you finally decide to get out of bed. Along with that, the app analyzes your sleep patterns and other factors that could be affecting how well you sleep, such as the weather, coffee intake, and exercise. Getting a good night’s rest can be the difference between success and failure for a college student, and Sleep Cycle works to make your nights as productive as possible. This recommendation is cheating a bit, due to the fact that Spotify itself is free to use. However, the app is very limited when you don’t upgrade to premium. Unlike the free version, which limits your listening to shuffling songs and limited skips, using Spotify Premium is like having every song ever made in your iTunes library. You can search for any artist and instantly be listening to one of their songs or albums. On top of that, the Spotify team curates some of the best playlists on the internet, always helping you discover new artists and songs. Normally, Spotify Premium costs $10, which is a pretty steep price for most college students. However, university students are able to use the students for $5 a month, a steal considering all the content one is able to access. Spotify is always providing users with fresh new songs and old favorites alike. I have a hard time remembering things that I need to do if it’s not all right in front of me. Between class assignments on Moodle, things I need to do for friends in my email inbox and those little errands that I remember need to get done while in the shower, it’s easy for important tasks to completely leave my mind, never to be seen again. While everybody has different productivity tricks that suit them best, one that I think helps me stay organized is Wunderlist. Wunderlist is a very powerful to-do list app that syncs with the web. Whenever I receive a new task I need to complete, I simply put it in the app and set the due date. Later, when I have a free moment, I look through my list to determine what I can do and when. And, because Wunderlist syncs to the web, I am able to check what I need to do on any device I happen to be close to. This app has kept me organized and conscious of the work I need to complete throughout my college career, and I can’t recommend it enough to my peers. These apps are some of the few that I truly believe can make the college experience more productive and more enjoyable. Whether you’re catching up on sleep, studying for that big exam, or taking a road trip with friends, the power inside our cell phones can alter and improve our lives. Do you have an app that you just can’t live without? Let us know in the comment section below!